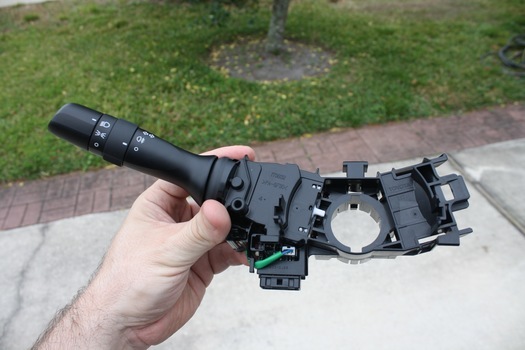 If you're upgrading your light stalk for one with a fog light switch or just replacing a broken wiper stalk, this guide will show you everything you need in complete detail. It's much easier then it appears, I put off doing this upgrade for a long time. In the end it ended up taking about 30-45 minutes with no real difficulty. Just follow the steps below and you'll be done before you know it. I went through this procedure to add a factory fog light switch to a FR-S that didn't previously have fog lights. It's the cleanest solution, and all of the hard stuff is just built in (the fog light stalk plugs in, and functions automatically. The ecm powers the fog light wiring that already runs down to the bumper! You even get a built in indicator light for the fog lights on the dash. If you're doing the same, check out the site for a full fog light install guide. Make sure you disconnect the battery. You'll need to remove the air bag - to keep surprises to a minimum, we'll make sure there's no chance of accidentally setting it off. 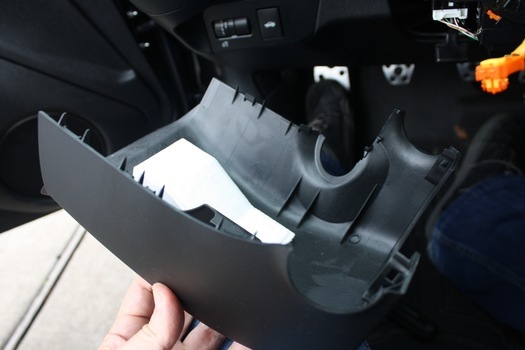 These steps are covered with more detail in my article on removing the air bag cover. 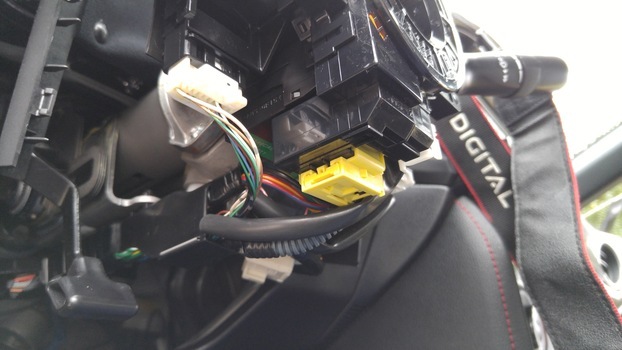 Remove the air bag by disconnecting the 3 wires. These steps are covered with more detail in my article on removing the steering wheel. 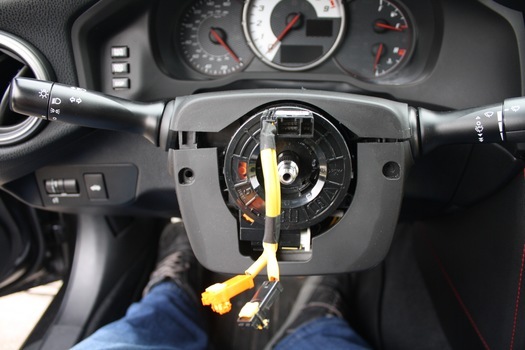 Remove the white wire that connects the steering wheel to the clock spring. Pop the steering wheel loose by pulling it away from the steering column. 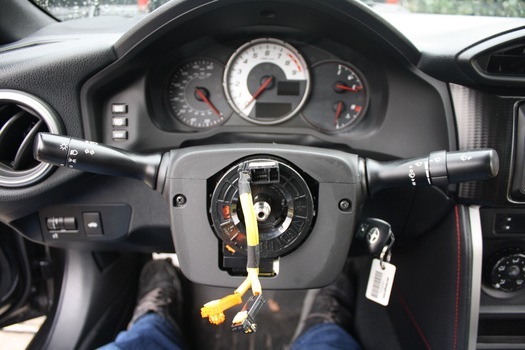 Remove the steering wheel, feeding the wires through the hole in the wheel. Remove the 2 phillips head screws on either side of the clock spring. Remove the lower steering column trim. It just clips together along the seam. Be careful not to snap any plastic tabs, it'll come apart without applying much pressure. Flip the top steering column trim back. The top trim is attached to the gauge cluster with a dust flap. Just fold it back out of place. 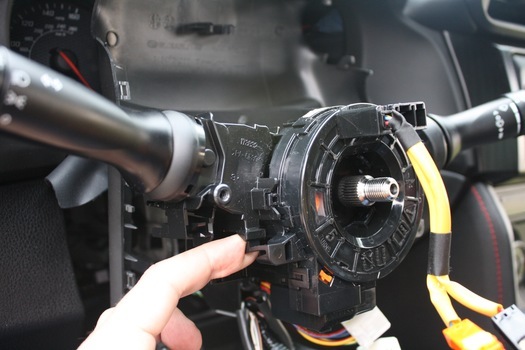 The clock spring contains long ribbon cables that allow the electrical connections in the steering wheel to function while the wheel rotates. 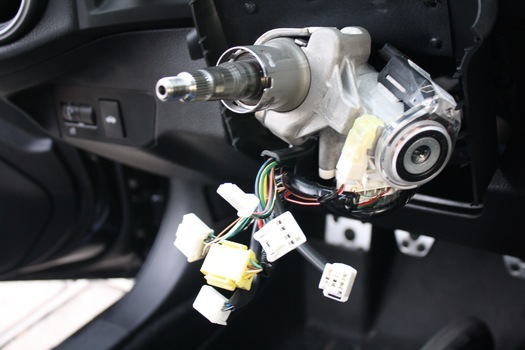 If it is re-installed in the wrong position, the steering wheel will pull the wires. Make sure you re-install in the exact position you started in. Disconnect the 3 electrical connectors on the bottom of the clock spring. There's a white and yellow one on the front bottom, and a small white one on the bottom rear that's harder to see. The yellow one is a little different from the rest of the clips. To release it, press a flat screwdriver into the left side. The inside slides till the connector pops loose. It's very simple, it clips on with little plastic clips on the top, left, and right. Don't rotate it when you take it off and make sure you put it back on in the exact same place. Disconnect all 3 the electrical connectors on the 2 stalks. There is 1 on the light stalk, and 2 on the wiper stalk. You do not need to remove the one for the ignition key. If you are only replacing the wiper stalk, you don't need to remove the entire bracket. Skip the next step. Remove the wiper stalk bracket. 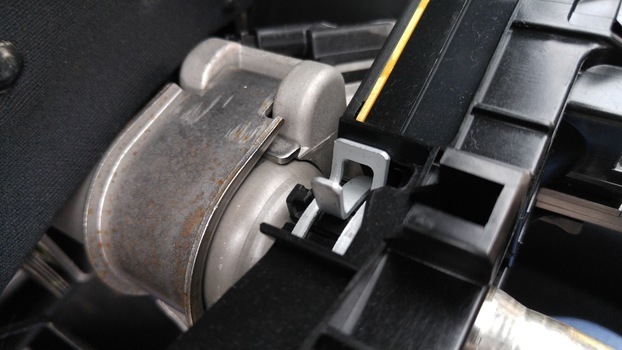 The bracket is held in place by a metal expansion spring that goes around the steering column, and a small plastic clip under it. Squeeze the spring clip together with a pair of needle nose pliers, and hold it open. 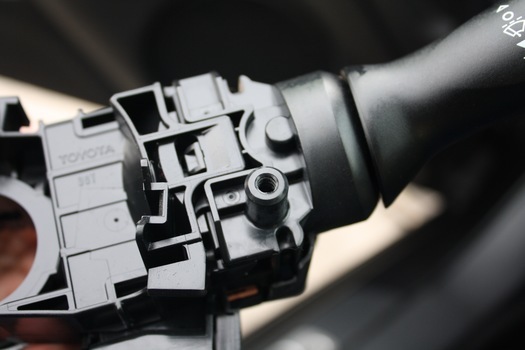 With your other hand, carefully pull the plastic clip up and wiggle the bracket off the steering column. The light stalk is one piece with the bracket. However you can remove the wiper stalk from the bracket. 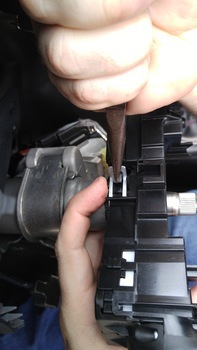 Just press the plastic locking tab down and slide the wiper stalk out of the bracket. Whichever parts you're replacing, assemble the two stalks together. Hold the metal spring open and slide it back onto the steering column. Once the plastic clip slides in place, release the metal spring. If you're replacing the light stalk with a new one, it'll have a little red tab to help assembly. When the stalk bracket is in place on the steering column, just pull the red tab off and it'll release the spring. Nice. Re-install all the electrical connectors on both stalks and the clock spring. 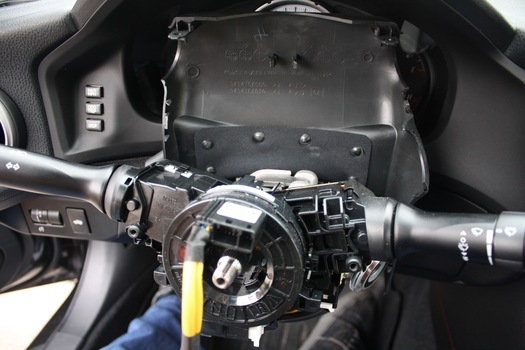 Install the steering column trim using the 2 philips head screws. Install the steering wheel and torque the 17mm center nut to 29 ft-lbs. 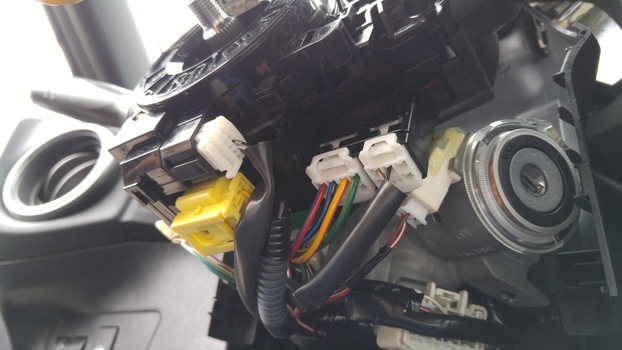 Connect the 3 air bag wires. Steering Wheel Nut: 17mm and 29 ft-lbs. I just found out I was sent the wrong wiper stalk. Somehow I got one that fits perfectly but only has provisions for a rear fog light and no forward facing fog lights. I'll have to return it and order a new Tundra stalk.